Treatments are focused more specifically on encouraging enhanced esthetic results. 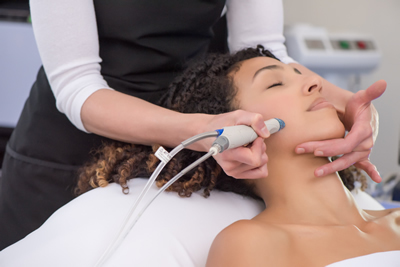 Created to provide maximum rejuvenation in the minimum amount of time. This specialized treatment gently, rapidly, and effectively smooths and deeply hydrates your skin, improves your skin tone, improves your skin texture, refines enlarged pores, clears congested skin and bring out your vibrancy. This treatment is renowned for supporting over-all skin health. In addition to providing all the benefits of the Basic HydraFacial, this treatment specifically treats hyperpigmentation and sun damage or fine lines and wrinkles with highly specialized, extremely potent, professional-grade serum infusions. “I loved the treatment so much…My skin felt amazing after the treatment, and it felt like a major "jumpstart" to getting it back on track. It felt clearer, but very hydrated. Sometimes, extra moisture can lead to other breakouts, but not the case here. It still feels so lovely! I found the experience of receiving it pleasant as well. It felt like it was doing something without ever feeling too harsh.” ~G.P. “My face has remained “baby soft” all weekend and is still today. My skin is always soft after a facial with you, but this definitely has lasted longer. I also think my blackheads on my nose still look really clear/small.” ~G.B. “It was a great experience. Quick & awesome in my opinion. My skin felt much more hydrated & luscious. I think it is like a time efficiency facial. Not ur infamous spoiling, 90 minute, dreamy, healing treatment. But something practical to do the main facial tasks that takes very little time.” ~N.M.